A supraspinatus tear is a tear or rupture of the tendon of the supraspinatus muscle. The supraspinatus is part of the rotator cuff of the shoulder. Most of the time it is accompanied with another rotator cuff muscle tear. This can occur in due to a trauma or repeated micro-trauma and present as a partial or full thickness tear. Most of the time the tear occurs in the tendon or as an avulsion from the greater tuberosity. 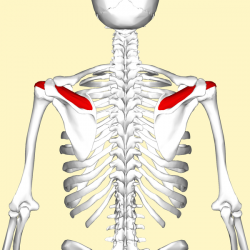 The shoulder joint is made up of three bones: the humerus, scapula and clavicle. The head of humerus and glenoid of the scapula form a ball-and-socket joint. The supraspinatus muscle is located on the back of the shoulder, forming part of the rotator cuff. The rotator cuff consists of Supraspinatus, Infraspinatus, Subscapularis and teres minor. The rotator cuff covers the head of the humerus and keeps it into place. 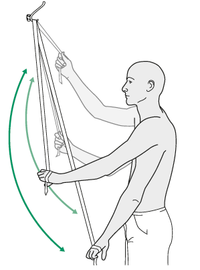 These muscles help to lift and rotate the arm. Also see the page for the shoulder for more detailed information. The etiology of supraspinatus tears is multifactorial, consisting of age-related degeneration, microtrauma and macrotrauma. The incidence increases with the age to about 50% during the 80s, mostly affecting the dominant arm. Injury and degeneration are the two main causes of rotator cuff tears. Rotator cuff tears are associated with older patients, a history of trauma and mostly affect the dominant arm. The most common risk factors for a tear consist of a history of trauma, dominant arm and age. When you have a degenerative tear in one shoulder, you have a greater risk for a tear in the opposite shoulder, even if you have no pain in the opposite shoulder. Supraspinatus tears normally present as partial or full-thickness tears. The can be asymptomatic or symptomatic. Same problems in the past? Subacromial grind test: Patient standing and examiner standing facing the patient, the examiner grasps the patient's flexed elbow. The shoulder is passively abducted in the scapular plane to 90°. The examiner's other hand is placed over the patient's shoulder overlying the anterior acromion and greater tuberosity. The examiner passively internally and externally rotates the shoulder detecting the presence of palpable crepitus. Tear in middle of tendon: Suture the two parts of the tendon back together. Tear close or on its point of attachment on the head of the humerus: Attach the tendon back to its original place by an anchor (sometimes two). This anchor actually consists of a small screw that is bored into the head of the humerus with on the back surgical wires which hold the tendon in place. Physiotherapy management depends on the extend of the tear, and plays in important role in both conservative management as well as post-surgical rehabilitation. More details can also be obtained from the rotator cuff page. A supraspinatus tear can occur in due to a trauma or repeated micro-trauma and present as a partial or full thickness tear. Most of the time the tear occurs in the tendon or as an avulsion from the greater tuberosity. The tear can be partial or full-thickness. Pain, loss of range of motion and weakness is the 3 most common symptoms. Supraspinatus tears can be managed conservatively, with NSAID's and physiotherapy, as well as surgically to repair the tear. ↑ 1.0 1.1 1.2 1.3 1.4 1.5 1.6 1.7 1.8 American Academy of Orthopedic Surgeons, Ortho Info. Rotator cuff tears, http://orthoinfo.aaos.org/topic.cfm?topic=a00064 (accessed 29/08/2018). ↑ 2.0 2.1 Benazzo F, Marullo M, Pietrobono L. Supraspinatus rupture at the musculotendinous junction in a young woman. Journal of Orthopaedics and Traumatology 2014;15(3):231-4. ↑ Schünke M, Schulte E, Schumacher U, Voll M, Wesker K. Prometheus: Algemene anatomie en bewegingsapparaat, 2010. p600. ↑ Physioworks, Rotator Cuff Tear.http://physioworks.com.au/injuries-conditions-1/rotator-cuff-tears (accessed 29/08/2018). ↑ 5.0 5.1 5.2 5.3 Tashjian RZ. Epidemiology, natural history and indications for treatment of rotator cuff tears. Clinics in Sports Medicine 2012:31(4):589-604. ↑ 6.0 6.1 6.2 6.3 6.4 6.5 Yamamoto A, Takagishi K, Osawa T, Yanagawa T, Nakajima D, Shitara H, Kobayashi T. Prevalence and risk factors of a rotator cuff tear in the general population. Journal of shoulder and elbow surgery 2010:19(1):116-20. ↑ 7.0 7.1 Mayo Clini Rotator cuff injury. http://www.mayoclinic.org/diseases-conditions/rotator-cuff-injury/symptoms-causes/dxc-20126923 (accessed 30/08/2018). ↑ Medscape. Supraspinatus tendonitis: Differential diagnoses, http://emedicine.medscape.com/article/93095-differential (Accessed 20/03/2015). ↑ Medscape. Rotator cuff injury: Differential diagnoses, http://emedicine.medscape.com/article/92814-differential, (Accessed 25/03/2015). ↑ 10.0 10.1 Hughers PC, Taylor NF, Green RA. Most clinical tests cannot accurately diagnose rotator cuff pathology: a systematic review. Aust J Physiother 2008;54(3):159-70. ↑ Sawalha S, Fischer J. The accuracy of “subacromial grind test” in diagnosis of supraspinatus rotator cuff tears. International journal of shoulder surgery 2015;9(2):43-46. ↑ Orthop J. Rotator cuff tear: physical examination and conservative treatment. Department of Orthopaedic Surgery Tohoku University, 2013:197–204. ↑ Björkenheim JM, Paavolainen P, Ahovuo J, Slätis P. Surgical repair of the rotator cuff and surrounding tissues. Factors influencing the results. Clinical orthopaedics and related research 1988;(236):148-53. ↑ 15.0 15.1 Millar NL, Wu X, Tantau R, Silverstone E, Murrell GA. Open versus two forms of arthroscopic rotator cuff repair. Clinical orthopaedics and related research 2009;467(4):966-78. ↑ American Academy of Orthopedic Surgeons. Rotator Cuff Tears: Surgical Treatment Options. https://orthoinfo.aaos.org/en/treatment/rotator-cuff-tears-surgical-treatment-options/ (accessed 30/08/2018). ↑ Akpınar S, Uysal M, Pourbagher MA, Ozalay M, Cesur N, Hersekli MA. Prospective evaluation of the functional and anatomical results of arthroscopic repair in small and medium-sized full-thickness tears of the supraspinatus tendon. Acta orthopaedica et traumatologica turcica 2011;45(4):248-53. ↑ Kuhn JE. Exercise in the treatment of rotator cuff impingement: a systematic review and a synthesized evidence-based rehabilitation protocol. Journal of shoulder and elbow surgery 2009;18(1):138-60. ↑ 19.0 19.1 Kristian Berg, Human Kinetics:. Prescriptive stretching. 2011. ↑ Joseph Berman MD. Supraspinatus tear, http://www.josephbermanmd.com/diagnosis-treatament-of-the-shoulder/rotator-cuff-tear/ (accessed 29/04/2015). ↑ Physioroom. 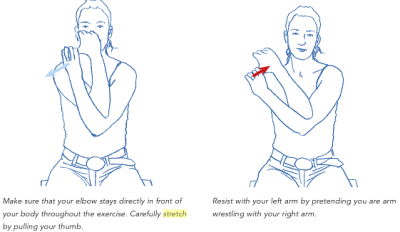 Exercises to Strengthen the Rotator Cuff Muscles in the Shoulder.http://www.physioroom.com/experts/asktheexperts/answers/qa_mb_20050225.php (accessed 31/08/2018). ↑ Heers G, Anders S, Werther M, Lerch K, Hedtmann A, Grifka J. Efficacy of home exercises for symptomatic rotator cuff tears in correlation to the size of the defect. Sportverletzung Sportschaden: Organ der Gesellschaft fur Orthopadisch-Traumatologische Sportmedizin 2005;19(1):22-7.